If you are looking for the perfect party game idea for your next gathering then you have to check out this fun and easy saran wrap ball game idea! We played this last year at Christmas for both the adults and the kids and it was a huge hit. I’ll show you how to make the saran wrap ball and how to play the saran wrap ball game. One thing I love about the saran wrap ball game is that it can be played with adults, kids or both! Everyone had such a fun time playing this game and I learned a couple of things that are important to factor in before playing it! I’ll share those with you so you can play this game successfully at your next party. Order everything you need for your saran wrap ball game now! Once you have your supplies you simply start wrapping one item up and keep wrapping the saran wrap around and around in various directions, adding prizes randomly to it as you go. You can make yours as big as you want! To play the saran wrap ball game you’ll need your completed saran wrap ball, a pair of dice and a pie plate or bowl. Begin by sitting everyone in a circle and giving one person the saran wrap ball and the person to their left the bowl/pie plate and dice. To play you must keep the ball on your lap at all times and unwrap it as fast as you can while the person to your left keeps rolling the dice until they get doubles. Once they roll doubles the dice will pass to the person on their left and the saran wrap ball will pass to the dice roller. Once the person to their left rolls doubles the ball gets passed again. Keep unwrapping the saran wrap ball as fast as possible the entire time the person is rolling, until they roll doubles. You get to keep any prizes you unwrap. The ball must stay on their lap as we discovered that without this rule someone can easily set it on the floor and unroll it in no time. We discovered that it would be even more fun to let the kids have their own saran wrap ball game and the adults get their own so the prizes would all be age appropriate. It’s a TON of fun and it’s really easy too so any age can play. Our readers love this game and have come up with many different variations of the saran wrap ball game! We have compiled all the different rules and variations in this saran wrap ball game rules variations post! Check it out and decide which one is your favorite way to play! 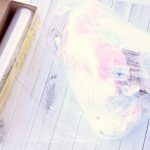 CAN SARAN WRAP BE RECYCLED? Once your saran wrap game is finished, gather up the saran wrap and set it aside. Saran wrap can be recycled! Most grocers and large retailers such as Target and Walmart now accept plastic bags, wrap and film for recycling. Look for a bin near the front of the store. To find a list of participating locations near you, go to plasticfilmrecycling.org and enter your zip code. So what happens to it? Most of the recycled plastic film ends up being made into composite decking! So it may just find it’s way back to your home in the form of composite wood. Like this post? We love when you share our posts on Facebook or Pin them for easy finding later! 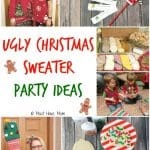 How To Host An Ugly Christmas Sweater Party! 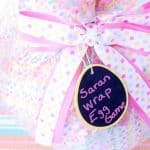 Saran Wrap Easter Egg Game Idea + Filler Ideas! This looks like so much fun! Question: would this be appropriate as a classroom game (like 25 kids?) Is that too many? Absolutely. We play with a large group of both adults and kids, so it would easily work for a classroom. If you wanted to keep it more exciting, you could do a couple balls and have two groups going at once. We did this last xmas with the entire family but instead of the dice we did it with music(hot potato) & it was tons of fun. Family is asking for it again. I found that WalMart brand saran with side cutter, works the best. It is awesome will not let you down. To use for the saran ball. We played this last year and it was so much fun! We have everyone chip in $10.00 to cover the cost. One thing we have done a bit differently is buy bigger prizes like a package of toilet paper, cheap wine, wine glasses, candles, etc. we then wrap all the gifts that don’t fit in the ball and number them. We put the same amount of numbers on a tag and wrap them throughout the Saran Wrap ball! This way you don’t have to be limited to small sized prizes, works great. It’s kind of fun to put a couple of “steal” tags in the ball where a gift can be stollen or a tag that says reverse game or skip two people! What ever you can think of to make it more fun. You can do it either way. Sheets are harder and continuous is a little easier if kids are playing. Oh these are GREAT ideas! Thanks so much for sharing them with us! Anyone who does this is a monster. All that wrap will definitely go in the garbage afterwards. We are supposed to be polluting less plastic people. A few people do this and it will undo 100 years of not using straws. My community has a plastic wrap recycle program so it will be recycled. Plastic wrap is hardly ever recycled even when you think it is. 75% of all plastic ends up in landfill or the ocean. This game does look fun be we really need to consider the environment and make better choices. Totally agree. This is teaching our kids to waste plastic and pollute our environment. There are many other more eco friendly ways to connect with each other and have fun. Think before you do this! We played this at our family party last year too and it was a big hit. I had a separate ball for the kids. You want to wrap several times between each prize. No tape, but cut the wrap and switch directions so they have to look for the next place to start pulling. You don’t want it to be as easy as just unrolling it. You could even make the adults wear oven mitts if it seems to be to easy! I found the red doesn’t cling as well as the clear so this year I’m trying it with the clear. Have fun! We did this last Easter. I started with a large plastic egg in the center and wrapped around it. Since it was Easter, I put a photo of Jesus inside, to reinforce the idea of the Resurrection AND He is the best “gift”. In the end it took on a rather “egg-shaped” form. We used a gina t roll of saran wrap form Costco…Pretty sturdy and easily handled without turning into a tangled mess. 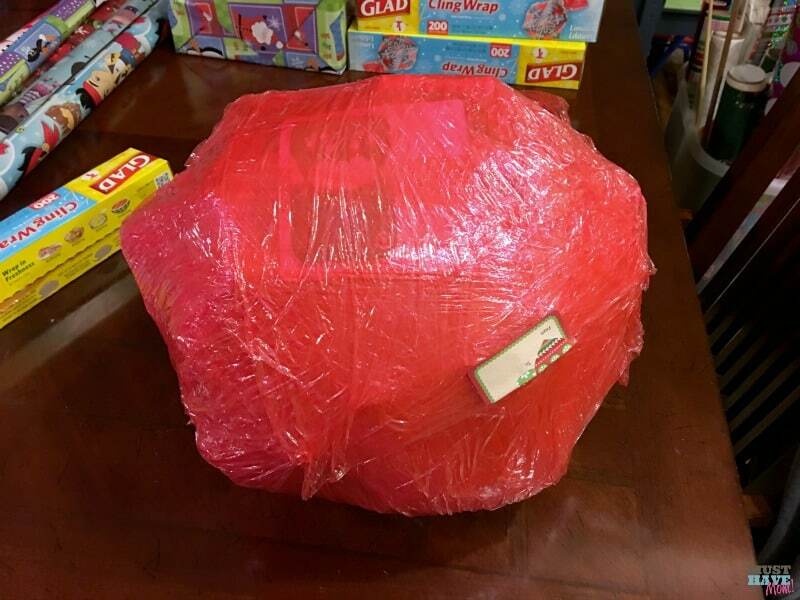 We wrapped around the ball a couple of times as each prize was added and then tore the saran wrap and started wrapping/adding prizes in a different direction, so it wouldn’t be possible to just grab and an end and flip/unroll it. I made two balls, one for the grownups and one for kids under 17, because that’s what our group consisted of. The grownups were so into it that women were braking nails. One of the younger kids said that was the most fun thing she’s ever done. It takes two people to do the wrapping easily and efficiently, (one to hold the saran wrap and the other to insert prizes) but it was SO worth it. Planning on doing it again the year! We have teens and college aged kids we played this with. In order to keep someone from just unrolling too quickly, we put some tiny pieces all along inside the wrap, too. We ruled that anything that comes out, must be picked up and placed in a bowl before more unwrapping can be done. We played on a table top, so things kind of flung, wound up on the floor, etc. Having to stop to pick up and place in bowl slowed the unwrapping a bit. We went through about 12-13 plays with two rolls of saran wrap. I want to do this for several kids but give each kid a chance at it….there would be ages 2-15, 7 kids total. Any suggestions for this big age gap? They are 2, 10, 10, 13, 13, 14, 15. Also, there are three families that make these 7 kids. Myself – 3 kids, cousin – 2, other cousin – 2. How can we divide who brings what??? You can ask for 3 gifts or so per person and put a limit on it. There is no need that this need to cost a lot. Things like lip gloss, candy, gum, holiday socks, and maybe a few toys are perfect. You can also modify the the rules so that the younger kids get to unwrap until the dice roller gets doubles twice. We played with ages 2-60. At the end of the wrap, you could trade something you got with someone else. The adults would trade with the little ones for something they might want. Some adults would use a certain gift card or “prize” over another choice so this way we had as much fun trading as we did unwrapping the ball. That sounds like a fun variation! This looks like fun, you could never play it in our house though because it would be covered with cat fur! We played this at our family christmas. We found when you wrap the syran wrap several times around the gift,then tear off and start again…..wrap, wrap, then add another gift, then wrap, wrap, then tear off, then add another gift and wrap, wrap……you get the idea. It is harder and a lot more fun. Every time the syran is torn off and start again the player has to find the end to pull. A heap of fun. We did this at Christmas with 14 kids and adults. I made two balls and started one on opposite sides of the circle. We used old cookie sheets to roll the dice on. Each ball had 40 to 45 gifts. The best gift in the middle … A roll of quarters. Everything came from the dollar store or 50 cent bins at crafts stores. HINT: Alternate between Saran Wrap and Press n Seal. I used a different length of wrap for each gift. Everyone had a blast and we will do it again. We did this last Christmas and I alternated between cling wrap and some press n seal, it made it more difficult, thus prolonging the fun!! Since you can’t tear it, must be unwrapped so sometimes it would go to a few people before getting the press n seal off. There were 8 of us playing, my husband, myself, and our kids who are in their early to mid 20’s, and their significant others, EVERYONE had a blast with it!!! They’ve all asked to do it again this year!! I put in candies i.e. Kisses, mints, etc, lottery tickets, 1 dollar bills and deeper into the ball a few $5’s and a $10 in the middle. We did this the last 2 years.. Use Press and seal a lot .. Short pieces. Press and Seal make it tougher for adults. We used oven mitts and will do that again. Did it at the table and we had stuff all over. We did put change in now and then a long with MM and candy kisses. Even put in some scratch off tickets and gift cards. We used 2 rolls of the good Saran and Press and Seal. This year we will put in small notes with numbers on them so they can go to a grab bag where we will have numbered gifts..1 for example will be a Big candy bar..#2 will be a glass of wine, #3 the bottle of beer, #4 you get to clean up. #5 new bath towel #6 ear muffs #6 slipper sox #7 anything that makes them do a chore or give a hug to grandma or an aunt of uncle. Yes we are all adults. Oh these are all fun additions to the game! Thank you for sharing your ideas!! I love this idea!! 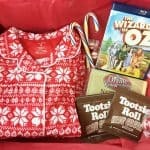 It would be so fun to watch my son unwrap this lol! The kids have an absolute BLAST doing this! I love this. I’m going to suggest it at our office Christmas Party. We usually do a white elephant, but this sounds like so much more fun! pieces of plastic wrap or one continuous roll? You can do it either way! Multiple pieces makes it a lot more difficult so it works great for older kids and adults. The continuous piece is easier for younger kids. I’ve played this game many times but I had the students wear oven mitts when it was their turn. It added a bit more of a challenge. They loved it!! This game was a big hit at our family Christmas party!!!! I wrapped each gift item several times before I added each gift. Oven mitts make it more fun and challenging. We would set a timer for 1 minute and then pass the mitts and ball to the next person. I used anything from candy to gift cards. This year I am going to play Christmas music and when the music stops, then pass the saran ball (like musical chairs). I also tried to make sure there was enough items for each person to have at least 2 gifts. The grand prize gift was the last thing to unwrap. We played this last year at Christmas too, It was a blast and loved by all. They want to play again this year, so we are having each family bring a few gifts to Thanksgiving to be added to the Christmas ball. Kids and adults played together, but if a child ended up with a travel size bottle of Vodka or something, they traded at the end of the game with someone who won candy. This game has become a tradition for my family. We have about 14 adults and we each give $$ To one person and that person purchases the, gifts, lottery tickets and small amount gift cards. We also make a small gift box that is used for cards that we add to the ball with instructions on them, if while you are unwrapping and you receive a card you must follow the instructions on the card. (Examples of cards…pick a prize from the box, skip your next turn🙁, take 5 extra seconds your next turn, play gopher to everyone until your next turn.). The center prize is a monetary gift of $5 x the number of people playing. 14 people = $70. Great fun!!! I love this idea! It looks like a fun thing to play with my husband’s large family. Ok question I’m doing it for an office party with about 50 people. Do you think 2 balls is what I should do? and do you use oven mitts or not? I did two balls for a family party of 50+ and it was better. Otherwise the last person in line has a long wait to wait for 50 other people to have a turn. We had one moving to the right and one moving to the left. If u are the person add items to tha ball can u still play? We had 20 people and 3 balls…..lots of fun, will be doing again this Christmas. Dice is the most fun, everyone screaming doubles, doubles….and saran flying everywhere! If you tear off the wrap and change directions you don’t need mitts. Also keep the ball on laps like someone else said. They now want to do this every year!! How long do you think this game will take? Thinking about doing it at a fourth grade holiday party. There are 25 kids in the class. we played last week with 10 adults and it took about an hour(apprx 20 gifts in the ball). we wrapped each gift individually then added to the ball. if not wrapped individually, it may go quicker. We love this game in our family. It has gotten costly since the kids have gotten older. We now fill it with cash ($1 and $5), lottery tickets and lots of candy and small items. I also add in Easter grass, confetti or (for Christmas this year) TINSEL…or I think they’re called Icicles now. 🙂 Makes for a huge flying mess and a great photo at the end! We also play that the ball can’t touch the lap OR ground that way they are holding it up with one hand at all times and makes it last a bit longer. How many rolls would you recommend? Also If we are playing with oven mitts, should the person rolling the dice wait until the person gets the mitts on before they roll so that person has a chance to unwrap? Wtf do you have a million ads on your blog?? Endless scrolling just to get to the point of the end of your blog entry. Pay for your website instead of getting a ton of advertisers. If you don’t like it then get off the site rather than being an annoyance. I was thinking of doing this for a 2nd grade Christmas party. There are about 20 kids and I only have 20 minutes or so for a game. Do you think this will take longer than 20 minutes? I would like a little more info as well on how long it takes kids to unwrap the ball. This is a station at my daughters christmas party but I don’t know how many saran wrap balls to make or how long to expect it to take kids… any advice. There will be 4 groups of 15 kids each. If playing with kids I would probably use the “musical chairs” music idea. Some kids can roll dice faster and others not so much. You can control it better with music in case one child has difficulty. Remember not everyone will get a prize. The more competitive kids will get several while others won’t get any. The amount of time they have to try can regulate the game a little better. Just my observation. No it goes pretty quick. I think I will start buying after Christmas. You can get a lot of small items on clearance. Start wrapping it now . It will make it more fun for you also, if you are like me I will forget what i put in it by next year. Add to it all year long. This could be more interesting than opening stockings. Randomly, about two weeks before Christmas, family members would add one at a time to the ball, followed by another. Since a record of additions was made until all had attached their stocking stuffer. When the great event, any starting sequence commences until the first item is obtained. And then this is passed on to the next person in sequence, regardless of selection is determined, until items have been retrieved. Variations in swapping prizes could be added for another family interaction. What do you use the bowl and pie plate for? This is a great game to play with your family and friends. I am doing it at my sleepover with my 7 friends and it will be so much fun. We did something like this before but, we had to put on oven mittens and try to unwrap the wrapping paper and inside the wrapping paper was a box with wrapping paper over it and it kept going and the last box had a 50 dollar gift card to T.J. Max and it was BLAST!!!! That sounds like a GREAT game! How fun! I love this idea so much, I posted a link to it on my own blog as a must try! Thanks for sharing this! I did it last Christmas and it was a hit. I put in things like a card of moustaches, artificial dentures, funny glasses, etc and anything that could be worn had to be worn – a lot of fun. (The guys ended up putting the moustaches on their eyebrows etc . Thanks for the idea. Oh that sounds like a lot of fun! Thanks for the ideas! I’m so glad you enjoyed the idea and it sounds like you had some fun additions to your saran wrap ball! This sounds like so much fun! Is there a version of this that might be better for the environment? It seems like you use SEVERAL ROLLS of saran wrap and that seems extremely wasteful to me. There are 300 million tonnes of plastic produced EVERY YEAR and I don’t think this game is helping with those numbers. I really think we as humans need to respect and share the earth. I don’t want to kill sea turtles or even us, because the BPA and DEHP go into the water systems or soil and that would eventually end up in our food. Do you have any suggestions for alternative products? I don’t know what else you would use. If you can find some better environmentally conscious option for clear plastic wrap then that would work but I’m not aware of any. If that bothers you then I would suggest avoiding this game and trying another instead. Thank you for the suggestion. I believe that this should concern everyone since we all live on the same planet. We should treat it with respect. These are all great ideas for putting in the saran wrap ball! Thanks for sharing! Put the two dice into a clear plastic container with a lid. Makes passing and rolling SOOOOO much easier! Old newspaper, they are big enough and you can use layers of them, like literally plastic wrap as a whole should be banned, they are the worst. Have you done this with newspaper? Thanks for sharing the tip! It’s so much fun! I hope you love it. If we have 13 or 14 people playing, what are the chances of the last players not getting a turn? If the ball is unwrapped too fast, I would hate to run out of prizes before the last couple of people had a chance at the ball. Just trying to plan ahead. Make sure that people keep the ball on their lap. This slows things down considerably! We had about that many playing and everyone got a turn at least once! It depends on how big you make it too. We played last year for our “breakfast club” Christmas party. I didn’t know about the lap thing and we played around a pool table. We wore oven mitts. The ball was over a foot in diameter and it took over 2 hrs! It went around the table at least 30 times, I’m guessing. Depends on how long it takes to roll doubles. I’m in the process of making ours for this Sunday. There are a lot of bar related things, koozies, candy, key rings, socks, earrings, scratch tix, etc. Lots of fun!! I love all the suggestions about alternating with the cling wrap, using a pie pan for the dice and keeping ball on lap. These are great suggestions! I love the addition of oven mitts! We cut the saran wrap between each prize. It made the game last a lot longer. Also, the unwrapper had to put on oven mitts before they started unwrapping and the ball has to stay on the table. These are brilliant variations! Thanks for sharing with us. I used to play this game as a child but we used giftwrapping paper or newspapers. I like the idea of the saram wrap but do you think it would be too challenging for 3-4 year-olds? For younger kids I would suggest using one continuous piece and helping them start it. Then it should be okay for them! Omg why….. That’s so much plastic and it’s so wasteful and so damaging to the planet. If you have to play this game why not use newspaper instead? Everyone is having a blast with the game, try it, you will love it! Newspaper will open easy, not a challenge at all…..most people don’t even have newspapers anymore, we read the news on the internet, it saves money and trees. I encourage you to try the game, you can recycle the plastic wrap. Merry Christmas! We love this game and I try to put in weird/funny prizes as well as good treats! Throughout the year I collect odds and ends so that at Christmas I have a great stash. 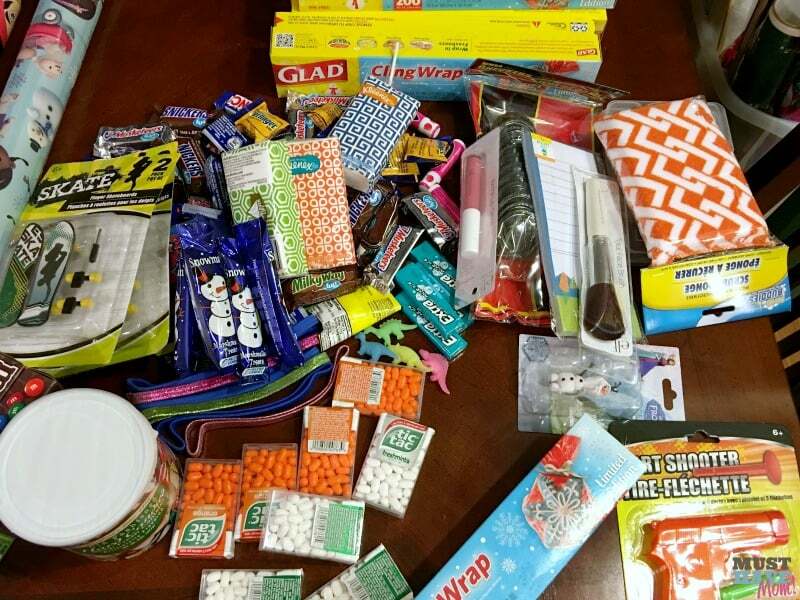 This year’s ball includes a box of Jello, hotel shampoo, pop-up turkey timer, dental floss, make up wipes, sample mouthwash, ink pens, and lots of candy. I love this idea and have my ball all ready to go for this year. If they love it, I am going to do it again next year with a twist (youngest is 13, will be 14 next year). I am going to wrap some gifts in smaller balls and add them to the big ball. When the person gets to a small ball they will have to choose which to continue to unwrap….the large one or the smaller one (of course if the dice aren’t kind they may be able to do both) If they choose to continue with the big one they hand over both to the next person, when doubles are rolled, and the next person has to choose which to unwrap. I have done this game many times using oven mitts and a Santa Hat to be worn by whoever is doing the unwrapping. Oooo that’s a fun twist! We have played this for the last 5 yrs. My group ask for it every year. We made a few changes. As my grands have gotten older – I use a hair dryer on the finished ball just to make it a little harder to find the first edge. First person to throw doubles starts unwrapping the ball. The dice continue going from person to person until someone else throws doubles – then they grab the ball from the person unwrapping. Oh my! I love your idea of using the hair dryer on it to make it more difficult. So much fun! So what is one supposed to do with all the non-recyclable plastic at the end of the game? The idea is good bit the consequences can never be undone. Jeez, all these people who are so worried about the wasted plastic need to get a grip! As much plastics that are produced by big industry every year, a few games of saran wrap ball arent going to make a bit of difference on a planetary scale! If you are so worried about the few rolls of saran wrap then you obviously arent reading this to get ideas, so you are just injecting criticism and negativity. Get lost already!! If a person unwraps a gift, is their turn over or do they keep on unrolling the saran wrap? Their turn continues until the person next to them rolls doubles. Then it is passed. We did 2 balls at Christmas time. For the little kids (one of whom is highly excitable) they unwrapped until they got a gift, then they passed it on. At the end we allowed them to exchange gifts with anyone who wanted to exchange. The big kids had to roll doubles. We did both balls at the same time in circles on the living room floor.